Pewley Down is a Local Nature Reserve on Chalk Downland, managed by Guildford's Countryside Team. 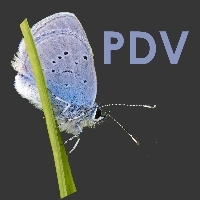 PDV assist the team in cutting back the scrub and conserving rare plants and insects found on its slopes. Thesze include the Chalkhill Blue and the Small Blue Butterfly. PDV is a group of adult volunteers and we supervise teenage Duke of Edinburgh candidates who can complete the volunteering section of their Bronze, Silver & Gold badges with us. They must apply in advance and are given a certificate on completion. Parents of PDV volunteers are welcome to join in. You will always find us working on the First Saturday of the month, from 10am - 2pm. We stop for a break at midday. We meet at the Pewley Hill entrance to Pewley Down. DoE candidates work for 4 hours, and other volunteers work hours to suit them. All volunteers should be fit as the ground is steep and it is hard work to clear the scrub. Work boots and leather gloves with old clothes, long trousers and sleeves, are essential to deal with nettles and brambles. Goggles are worn. The work consists of clearing scrub using shears, loppers, bow saws and rakes. Mattocks & scythes can be used by more experienced volunteers. Safe use of tools and consideration for the safety of others is the first rule. Those adults using brush cutters need to be trained for the work & it is necessary to keep 10 metres minimum between brush cutters & others. Due to noise and goggles brush cutters cannot see others approaching & cutters can throw up stones. Those with some experience of conservation are welcome to join us, even if you can only come on an occasional basis. New adult volunteers need to provide 2 e-mail references. You will join a committed group of volunteers who have been working together for 14 years.